Billy Hamilton is one of the best athletes in the Reds farm system and one of the absolute toughest for me to evaluate. I had him slotted in anywhere from 10 to 24 until he finally landed here in the #11 slot. Hamilton combines one of the highest ceilings with one of the lowest floors in the system. His athleticism elevates his ceiling, while his limited baseball experience drives down his floor. This combination of attributes gives him an extremely wide range of possible career outcomes and it's up to the Reds player development department to start him on the career arc that enables him to reach his ceiling. 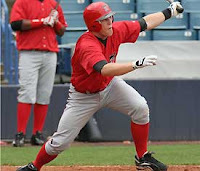 The Reds selected Hamilton with the 57th overall pick in the 2nd round of the 2009 draft out of Taylorsville High School. His off the charts athleticism turned the heads of many an organization, but it was the Reds who reeled him in. For Taylorsville, Hamilton was a three sport star, excelling in baseball, football, and basketball. The Reds had to sign him away from a football scholarship to Mississippi State University where he was slated to play wide receiver. He was also a guard on his high school basketball team, averaging 35 points a game in his senior season. As for baseball, Hamilton is obviously no slouch, taking home the Mississippi High School Player of the Year for Class 2a. While it is impressive that Hamilton's athleticism enabled him to excel in three different sports, his multi-sport career also prevented him from focusing solely on baseball. His divided focus prevented Hamilton from getting as much game experience as is typical for premier prospects. So, somewhat ironically, his athleticism is responsible for both his sky-high ceiling and his basement level floor. The Reds sent Hamilton to the rookie level Gulf Coast League after he was signed. He got in 180 plate appearances and despite a strong start, finished off the season with uninspired numbers. On the season, he posted a slash line of .205/.250/.277/.527 with a 47/11 K/BB ratio. He collected 34 hits, including 6 doubles, 3 triples, and 0 homeruns. He did flash his game changing speed, as evidenced by his 14 steals in 17 attempts. Hamilton got off to a hot start in June, which energized the fan base and started building his value. He hit a solid .333/.370/.375 with an impressive line drive rate of 20%. Even with the strong line drive rate, his BABIP was still abnormally high at .421, which was a sign of things to come. After a strong start, Hamilton hit the skids in July, posting a line of .158/.238/.193. Unfortunately, he was never able to right the ship, posting a .200/.222/.306 in August. On the season, he struck out in 26.1% of his plate appearances, walked in 6.1% of his plate appearances, and hit line drives at a paltry 14% clip. Obviously, his peripherals were as unimpressive as his overall production. Overall, it's difficult to draw any other conclusion than that he was completely overmatched against one of the lowest levels of competition in the minors. One mitigating factor could be Hamilton's attempt to become a switch hitter. Getting your first taste of pro ball is challenging enough, but trying to do it from the opposite side of the plate increases the difficulty exponentially. However, the somewhat disturbing part is that Hamilton was actually better from the left side than he was from his natural right side. In 37 ABs from the right side, Hamilton posted an appalling slash line of .135/.158/.162/.320. Granted, it's a very small sample size, but I'm not sure I've seen ever a lower level of production in a non-pitcher. In 128 ABs from the left side, he hit a more respectable .225/.279/.310/.589. So, obviously, it wasn't solely the switch hitting that dragged down his production. Hamilton is new to switch hitting. He's a natural right-handed hitter and is still working on his left-handed swing to better utilize his speed. But, for now, let's just take a look at his more natural right-handed swing. Hamilton hits from a wider than shoulder width stance and a slight crouch. He uses a high pre-pitch hand position and a small bat waggle. His stride involves two steps, first drawing his foot back slightly towards his back foot before striding even farther forward. After his stride foot plants, his hitting position is rather spread out. As the pitch is delivered, he draws his hands back into hitting position. When he does fire the swing, he opens up too soon with his upper body. In fact, his swing seems to involve too much rotational movement with the upper body, as he somewhat pulls his swing through the zone by spinning out with his upper body and front shoulder. Instead of keeping his shoulder closed and pointed at the pitcher, staying down and through the pitch, releasing the swing, extending out through the ball, and letting the arms finish around his body, Hamilton has a tendency to spin open his front shoulder too soon. The rotational style swing results in a flatter swing path and a lower finishing position for the hands. Another consequence of his spinning out too soon is a swing that is inefficient in imparting energy to the baseball, as power bleeds from the swing when the shoulders and hips fire too soon. Additionally, when the front shoulder flies open and you pull off the ball, it leaves you susceptible to pitches on the outer half of the plate. Hamilton's lack of extension and spinning out with the upper body gives him poor plate coverage, which helps explain his struggles with pitches down and away. Hamilton's swing may also lead to struggles against good breaking balls. From the left side, Hamilton is still a real work in progress. Initially, it seems the idea was for Hamilton to start a couple of feet closer to first base to more effectively utilize his speed. Not surprisingly, his swing is still very raw, as he's trying to find the balance and tempo to his swing. In addition, to learning new swing mechanics, Hamilton has to learn how to recognize and track pitches all over again, which is no small task. To become an effective switch hitter, he has a long way to go, as he'll have to both refine the mechanics of the swing and develop a plate approach. Overall, Hamilton is very, very raw at the plate. Regardless of the side of the plate from which he hits, he has a lot of work to do to develop an effective swing that will play against advanced professional competition. He needs to improve both his contact rate as well as his ability to drive the ball with authority. If you want to take a look at Hamilton in action, then check out the MLB scouting report and video clip here. Heading into the draft, Hamilton was viewed by many scouts as an outfielder. However, the Reds were one of the organizations who viewed him as a legitimate option at shortstop. His early season performance at short has rewarded their faith in his defensive abilities, as he flashed above-average range and a strong arm. For the Gulf Coast League Reds, Hamilton had 144 chances and converted 101 outs. He rated out quite well in TotalZone metric, posting a +5 in Runs. So, despite still needing to refine both his positioning and footwork, his plus quickness and speed allow him to really cover the ground at shortstop. He was a bit erratic, as evidenced by his 9 errors and .955 fielding percentage, but that's to be expected in a young shortstop. The initial read off the bat and the first step an infielder takes on a ground ball are key determining factors in whether the play is made. However, Hamilton's defensive performance was impressive and when he polishes up the finer points of his defense, he could become a true impact player on defense. Perhaps the most impressive aspect of Hamilton's game is his plus foot speed. He has both good quickness and impressive top end speed. When he runs you can see the electricity in his game, as he has the fast twitch muscles that quickly generate a lot of force. Hamilton is the type of runner who gets to top speed very quickly and when he does seems to almost glide across the turf. Obviously, Hamilton's value gets a huge boost if he can stick at shortstop, as it is very difficult to find a legitimate defensive shortstop who can actually be an impact player on offense. If you look around the minor leagues, there are actually only a handful of prospects who fit the bill. The ability that Hamilton flashed with the glove is what ultimately earned him such a high spot on this list, as shortstops who can both hit and field are scarce and scarce is valuable. Hamilton is an exciting prospect, but one that is difficult to evaluate. He's undoubtedly high risk, but also very high reward. He could develop into an All Star caliber shortstop or he could flame out entirely. Ultimately, when valuing this type of prospect, it comes down to preference. Whether you value certainty or upside. Whether you like low risk and a high floor, or favor a high ceiling and higher risk. While a lot of factors come into play, I typically favor the prospect with the higher upside and Hamilton certainly has that. Hamilton has the type of athleticism that could make him an elite prospect if he can learn to translate those tools into baseball specific skills. However, baseball isn't a game that always yields in the face of great athleticism. It takes a great deal of work to learn how to use that athleticism in a way that will generate usable production. It remains to be seen whether Hamilton will be able to effectively harness his abilities, but his upside is just too intriguing to land him any lower on the list than #11. 2009 Redlegs Baseball Prospect Ranking: "Other Notables"
J.C. Sulbaran arrived in the Reds organization with substantial hype, surpassed only by Aroldis Chapman in recent years. Like Chapman, Sulbaran generated the buzz with his performance in international competition. However, Sulbaran learned quickly that success at the international level doesn't always translate easily into success at the professional level. The Reds selected Sulbaran in the 30th round of the 2008 draft with the 899th overall pick. Sulbaran is from Curacao, but attended American Heritage high school in Plantation, Florida where he was a teammate of more highly regarded prospects in Eric Hosmer and Adrian Nieto. Sulbaran really made his mark in international competition, where he pitched for the Dutch team. He held the Cuban team to 1 run in 6 innings at the Haarlem Honkbal tournament. He squared off against the Cubans once again in the Olympics, where was less impressive, giving up 2 earned runs in four and two-thirds of an inning. He was also selected to pitch for the Dutch during the 2009 World Baseball Classic, where he gave up 5 hits and 3 runs in two and two-thirds innings, including a dominating 3-pitch strikeout of Ivan "Pudge" Rodriguez. His international experience earned him a great deal of hype and a spot in the rotation for the Dayton Dragons for the 2009 season. 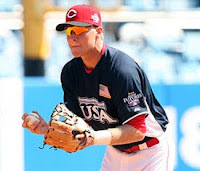 Despite his impressive performance in the World Baseball Classic, the Reds wisely were conservative with him, sending him to low-A Dayton for the season. For the Dragons, Sulbaran started 21 games, working 92.2 innings and posting a 5.24 ERA, 1.57 WHIP, 100/51 K/BB ratio, and a 0.60 GB/FB ratio. Obviously, despite his unimpressive overall performance, there are still components to like, as evidenced by his 9.71 K/9 ratio and his 1.96 K/BB ratio. Additionally, Sulbaran was a bit unlucky, as evidenced by his .317 BABIP and 69.2% strand rate. So, potentially a few more hitters than expected reached base via balls-in-play and a few more baserunners than expected came around to score. However, his strong strikeout rate is about the only positive to draw from his 2009 season, which was characterized by a high walk and homerun rates. He was inefficient with his pitches and struggled to keep the "balls-in-play" on the ground. Taking a look at Sulbaran's pitching mechanics may identify reasons for the primary characteristics of his performance, namely 1) good velocity, 2) poor command, and 3) high flyball rate. Sulbaran has a unique set of pitching mechanics. He might be the only pitcher I've ever seen who begins his windup with a movement of his pitching arm side foot. Instead of beginning his windup with a small step backward with his left foot or even a step forward and down with his left foot, he starts by rotating his right foot down onto the rubber. He does rock a bit to unweight his right foot, but his left foot stays firmly planted on the ground until his right foot shifts down onto the rubber. I really can't remember ever having seen that before. Once he does shift his right foot down onto the rubber, he brings his left leg up into a leg kick. In his leg kick, he brings his knee up well past parallel and uses significant hip rotation, which coils his body to generate energy and results in him almost showing his back to the hitters. His leg kick involves his lower leg wrapping around his body and his left foot actually ending up outside his right hip at the apex of his leg kick. Jamie Moyer uses a similar wrapping type leg kick, one wherein the foot is drawn back farther than the knee (and, yes this is likely the first and only time J.C. Sulbaran will ever be compared to Jamie Moyer, but there are some similarities in their leg kicks). Once he gets to the apex of his leg kick, Sulbaran begins his move to the plate, which is triggered by breaking down his right leg. He flexes his right knee to begin his drive to the plate. This knee bend seems a bit more pronounced when he works from the stretch, but one of the immediate consequences of this move is that it alters the level of his shoulders. His pitching shoulder drops in relation to his left shoulder, which means that as he begins his drive to the plate he is "throwing up-hill," so to speak. This is likely one reason for his difficulties in keeping the ball down in the zone. Another reason for his difficulties in keeping the ball out of the air is his upright posture. His upper body remains tall throughout his delivery, which can make it difficult to finish off pitches and work down in the zone effectively. Lengthening his stride would help him finish off his pitches, but as it stands his stride is somewhat short. Aaron Harang has struggled with this in recent years, as his spine angle has become too vertical in his delivery and follow-through. "Throwing up-hill" and standing too up-right are two likely causes for his significant fly ball rate, though power pitchers in general have a tendency to work up in the zone and get a high rate of fly balls. Still, Sulbaran's fly ball rate is pretty extreme, even for a power pitcher. After driving off the mound, his plant foot lands closer to the thirdbase side than is normal, which leaves him in a closed off position and results in him throwing across his body. This cross-fire throwing motion results in the momentum of his delivery pulling his body off to the first base side on his follow-through. This type of cross-fire throwing motion likely creates arm-side run on his fastball. In addition, Sulbaran seems to be inconsistent with his follow-through, as he falls off to first to a different extent on different pitches. Obviously, falling off to one side of the mound leaves a pitcher in less than ideal fielding position. In addition, when his plant foot lands his heel at times hits the ground first, which can result in an unstable foundation for the delivery. Pitchers such as Gil Meche and Randy Johnson took significant steps forward in their level of performance when they began to land more on the ball of their foot. Landing on the ball of the foot more effectively dissipates the shock of the delivery than landing on the heel. When you combine the inconsistency of his cross-fire delivery with the inconsistency in the landing of his plant foot, it's not surprising that he struggles to maintain a consistent arm slot. Right now, there is just too much inconsistency and looseness in his delivery, which helps explain his struggles with both command and control in 2009. While his command and fly ball rate aren't strong, he does generate significant velocity, which helps him wrack up the strikeouts and enables him to dominate hitters. In terms of efficiency and effectiveness, pitching mechanics can be thought of as a kinetic chain that is only as strong as its weakest link. However, from an injury risk point of view, the arm action itself is the most important factor in pitching mechanics. Good arm action provides a strong foundation around which to build a pitcher. It's easier to alter timing, tempo, balance, lower body drive, etc. etc. etc. than it is to teach a pitcher a new way to throw the ball. Despite some unsual pitching mechanics, Sulbaran does possess good arm action. Sulbaran's arm action does contain several positives. After he breaks his hands, Sulbaran shows the ball to second base when bringing it up into throwing position. Also, he maintains good elbow position in relation to his shoulder level. Finally, he doesn't overthrow by using so much effort that it strains the pitching arm, throws the rest of his delivery off balance, or causes the various moving parts of his delivery to fall out of sync. Additionally, Sulbaran's good arm action should provide for a reduced injury risk. Sulbaran has long, loose limbs that allow him to generate easy velocity from his high three-quarter arm slot. He's not a max effort guy, as he has a free-and-easy arm action that gives his pitches good hop and allows his pitches to get on the hitters before they are ready. Sulbaran's height also gives him an advantage, as he both releases the ball closer to the plate and throws on more of a downward plane than shorter pitchers. The ability to generate velocity increases both the ability to dominate and the margin for error on location mistakes. Sulbaran certainly has to refine his mechanics, but he does has some positives that could enable him to be an impact pitcher in the professional ranks. He has a nice three pitch mix with a fastball that sits 90-92 mph, a developing curveball that enables him to change the eye level of hitters, and an average change-up. 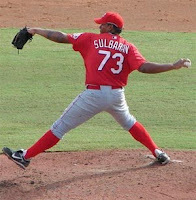 Sulbaran struggled in his first taste of pro-ball and looks to rebound in 2010. He would benefit from tightening up his mechanics, but he has a nice three pitch mix and easy velocity that could enable him to develop into a true impact pitcher. For now, Sulbaran's substantial upside outweighs his 2009 performance and the inconsistency in his mechanics to land him at #12 on the list. 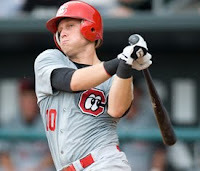 In 2008, Chris Valaika was awarded the Chief Bender Award as the Reds Minor League Player of the Year. He followed it up in 2009 with arguably the most disappointing season of any prospect in the entire system. Obviously, one bad season could be nothing more than an outlier driven by bad luck and nagging injuries. It's entirely possible that that is the case for Valaika, but the down year certainly did him no favors. Much like Danny Dorn, Valaika's inability to perform at a high level during the 2009 season likely cost him both a late season promotion and a shot at a full-time gig in 2010. He'll look to rebound in 2010 and reestablish his prospect credentials. If he can do so, then he may play his way back into the organization's immediate plans for the future. To say that Valaika had a forgettable 2009 season would be an understatement. Seriously. In fact, 2009 was largely a wasted development year for Valaika. At best, it forced him to face adversity, which some organizations like to see, as it forces a prospect to learn to deal with and overcome challenges. So, hopefully, Valaika emerges from 2009 with more mental toughness, which every player needs at the MLB level. Valaika spent the entire year with triple-A Louisville, where he struggled not only with his performance, but his temper as well. An ill-advised haymaker to a water cooler resulted in a fractured hand, which put him on the shelf for a chunk of the season. Still, given that Danny Dorn also struggled mightily with the promotion to triple-A, maybe there is something in the water in Louisville (another explanation for the water cooler incident?). Or, on a more serious note, maybe the jump to triple-A is a bit more difficult than previously thought. When Valaika was on the field, he hit a paltry .235/.271/.344/.615 in 366 ABs with 6 homeruns and a rather pedestrian 76/16 K/BB ratio. He had some stunningly bad months to start the season, posting a slash line of .176/.219/.353/.572 in 68 ABs in April and .120/.185/.120/.305 in 25 ABs in May. As bad as it seems, he was also somewhat unlucky, posting a line drive rate of 21% in April, but a BABIP of .188, and a line drive rate of 25% in May, but a BABIP of only .136. With that kind of bad luck, it's almost hard to blame him for taking out his frustrations on the cooler. On the season, his line drive remained a stellar 21%, while his BABIP was a somewhat low .282. Unfortunately, his strikeout rate jumped from 17.9% in 2008 to 19.4% in 2009, while his walk rate fell from 6.8% in 2008 to 4.1% in 2009. So, his plate approach seemed to suffer, which could either be a result of his struggles or one of the causes. It's just as easy to imagine him getting less disciplined at the plate as his struggles mounted as it is to imagine his struggles being caused by being overly aggressive and chasing bad pitches. Whatever the explanation, his approach took a noticeable step backward in 2009. Even early-count hitters need to focus on offering at pitches that they can handle, as consistently forcing consequences to At Bats on pitcher's pitches is a quick way to put yourself at a significant disadvantage in the all important pitcher v. hitter confrontation. On the defensive side, he continues to get extensive work at shortstop (77 games), but also spent some time on the right side of second base (18 games). His range at short still leaves something to be desired, as evidenced by his Total Zone Runs/150 rating of -4. At second, his range graded out a bit better, earning an average mark of 0 Runs/150. It was refreshing to finally see the Reds give him a look at second, as the versatility will only help his case. Even so, 2009 marked the first time Valaika had manned 2b at any professional level. Circumstances are working against Valaika, as his game profiles better at second, but the make-up of the 25 man roster would make it easier for Valaika to break in at shortstop. Valaika is a strong, sturdy ballplayer with a thick, muscular type frame. He's 6-0 tall, but tips the scales at a stout 215, which is a bit bigger than your typical middle infielder. Physically, he strikes me as being somewhat similar to Cleveland's Jhonny Peralta. In fact, his overall game reminds me of Peralta, who is more of an early-count hitter with good pop, limited on base skills, and fringe defensive skills at shortstop that forced him to switch when he outgrew the position. It's questionable whether Valaika will develop as much power as Peralta or has enough defensive skill to hold down shortstop for even a few years. Still, given the similarities of their respective games and body types, a Peralta type career strikes me as a likely ceiling for Chris Valaika. Of course, a lot would have to break right for Valaika to max out on his projection, but he still certainly has nice upside. At the plate, Valaika uses a wide-spread stance and a high pre-pitch hand position. He keeps his hands in front of his right shoulder and uses a significant bat waggle to stay loose while waiting for the pitch. While waiting for the pitch, he constantly grips and regrips the bat to ensure loose grip pressure and prevent tension in his swing. As the pitch is delivered he pulls his hands back into hitting position. He uses a high back elbow which he has to drop before firing the swing. His wide spread stance gives him a sturdy foundation for his swing. To transfer his weight, he lifts the foot up slightly and puts it right back down. His minimal stride is effective in transferring his weight, but doesn't result in significant cocking of the hips. Cocking the hips is one of the primary ways a hitter can generate power, but it's not the only way. Valaika is strong enough to generate power with both his upper and lower body to offset the less than ideal hip action. And, if you want another look at him, check out this quality Arizona Fall League clip of Valaika at the plate. As for his approach at the plate, Valaika is an aggressive, early count hitter. He's not the type of hitter who is going to see a lot of pitches or grind out At Bats to draw walks. He's a grip-it-and-rip-it type, who is going to pick a pitch and not get cheated on it. He has strong hands and wrists, which when coupled with his good hand-eye coordination enables him to make hard, consistent contact. He also can drive the ball with power to all fields. His swing, which is simple and uncomplicated, generally has a slight uppercut path to it, but at times he seems to get a bit top hand heavy in his swing. Valaika isn't overly fleet of foot. He doesn't get out of the box or down the first base line very quickly, so he's not likely to rack up many infield hits or swipe many bases. In his professional career, he has stolen 13 bases and been caught stealing 13 times. Obviously, he does more harm than good when he attempts larceny, as you have to swipe bases at a greater than ~70% clip to benefit your team. If you fall short of that mark, then you are actually costing your team runs. The question on Valaika, was, is, and continues to be whether he can handle shortstop, as the Reds are certainly in need of one. The consensus of the scouting community is that his range will be stretched at short and the defensive metrics seem to support that notion. Under the TotalZone metric, Valaika has only posted a positive Runs/150 number at rookie level Billings in his first taste of pro-ball. All his other range stats at shortstop are significantly in the negative, including a -9 in 2007 for Dayton, a -5 in 2008 for Chattanooga, and a -4 in 2009 for Louisville. On the plus side, Valaika has a strong, accurate arm, which plays well all across the infield, but he lacks quickness and his range is barely adequate. He profiles better at secondbase, but the Reds already have Brandon Phillips entrenched at the position and have shown little inclination to shift "The Franchise" across the bag to shortstop. So, for now, Valaika's best chance at a starting job with the Reds is at shortstop and he may ultimately be next in line after Orlando Cabrera's one year contract expires. Personally, I find it to be increasingly difficult to get behind the idea of a "fringe" defensive player at shortstop. The new statistical metrics are revealing defense at shortstop to be just too important to sacrifice for anything less than an elite, impact bat. Unfortunately, Valaika simply doesn't have that kind of bat, so whatever above average offensive production he provides will be dragged down by the runs he gives away on defense. Ultimately, I suspect that Valaika's terrible 2009 season has done little to diminish the organization's view of him. He will always be an offense-first type player, but he could have just enough defensive skill to carve out a few years of shortstop play at the MLB level. He profiles better at second, where he would likely acquit himself well defensively and his defense wouldn't drag down the value of his bat. At the plate, Valaika certainly has the potential to be a productive MLB hitter. I like his underlying hitting skills much better than his approach at the plate, but he has certainly made it work for him thus far. The Reds have made serious strides in improving the farm system over the past few years, but the organization still lacks much quality prospect depth in the middle infield. Chris Valaika is one of the organization's few bright lights in the middle of the infield, which for now lands him at #14 on the list.